Ottawa Junior Senator forward/center Christopher Piché is looking forward to the second half of the Central Canada Hockey League (CCHL) season. One reason, of course, is the Junior Senators, are the league’s defending champions. They are serious title contenders again this winter and Piché, a rookie with the club, wants to experience playoff hockey. A second reason is that Piché, who is 18 and a native of Ferme-Neuve, Quebec City, is playing his best hockey right now and anxious to make more of a contribution to the team. He missed the first half of the 2018-19 campaign because of mononucleosis, and is just now returning to peak, playing condition. He wants to make up for lost time and show everyone just how good he is which he believes he will now that he has returned to game shape. 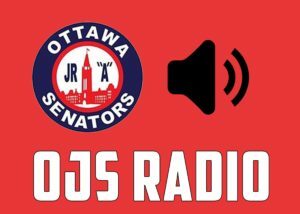 Now, Piché, who has played both wing and center for Ottawa, is ready to bring his best every night to the Junior Senators and being more a part of the offense. “My role is to bring grit, energy and speed,” Piché explained. It’s his offense that suffered the most from the months away from playing. Thus far, he has three goals to go with nine assists over 28 matches. “My offensive production can be better,” said Piché, who added he expects it to improve as he becomes more familiar with his teammates and more confident with playing time. Throughout his junior career, he’s been averaging more than a point a game. Like some of his teammates, Piché is juggling his hockey around school. He is attending Carelton University in Ottawa, where he takes classes on Tuesday and Thursday mornings. Those days are followed in the afternoon by practice, or, a rare night game. He’s taken classes in science, physics and law. As a native of Quebec, hockey has helped him learn English. It started when he left home to play in Halifax, where he had to learn English. There is no such thing as a language barrier in hockey. And, like many of his teammates, Piché’s long-term goal is to play Division I college hockey. Heading into the final third of the season, the Junior Senators are now playing their best hockey. They have moved up to second place in the Yzerman Division close behind the Hawkesbury Hawks.